First, let's begin by introducing Prussian Blue to our readers... can you give us a history to date? Lynx and Lamb started performing by singing at WN events in 2001 at a Eurofest in Sacramento California at the age of 8. At that time they didn't play instruments and just sang accapella. Dr. Pierce mentioned that it might be cute to record a CD and that is probably where the idea for the band was born. Though in reality at the time we had no idea that it would be anything more than a novelty to have children singing White Pride songs. 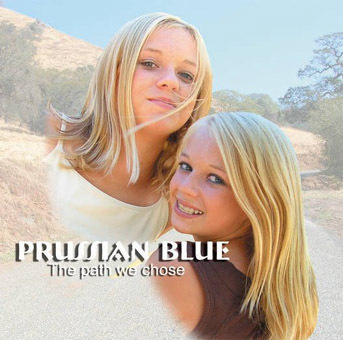 In 2003 we had to come up with a name for a performance and the girls chose Prussian Blue. When we had trouble finding backup musicians for the CD project the girls started guitar and violin lessons and decided after about 6 months to make the CD totally their creation by performing all the music themselves. This resulted in Fragment of the Future, a 14 track CD in which they perform various Skrewdriver, Rahowa and Brutal Attack covers as well as a few traditional songs and originals. It was finally released in late 2004. It was originally released with Ratsistance records in an abridged format but was later released by the band itself in it's full length version. The Fragment CD had quite a bit of worldwide success and so the girls felt that they could create something much stronger the following year. They had improved quite a bit as musicians and had written quite a few new songs. April wanted the girls to have the chance to create something that would be able to showcase the girls talent as songwriters and also that would allow the band to profit from their music rather than a record company. The Gaede family put up the money to record and print The Path We Chose which was released in late 2005. Meanwhile the band has received a huge amount of attention from the controlled media granting interviews with the BBC and Primetime as well as articles or mention in GQ, Blender, Newsweek, Bliss , Elle Girl, to name just a few as well as international attention and interviews in Nationalist publications from Sweden and Iceland to Greece and Italy. They are currently filming a documentary with Tiger Aspect of the UK and have just released a "legal" version of their music with the NPD in Germany titled For The Fatherland which consists of Prussian blue songs that are not banned yet by the German government. Both of the girl's CDs are now verboten in Germany. You've received a lot of attention from the mainstream media recently. Can you tell us about your experiences with this? Meanwhile we have seen and read a lot of crazy things about ourselves in the news. We have seen Donny Deutsche ( The Bid Idea) say that we should be "thrown in prison" for wearing the funny cartoon shirts of Hitler and we have had psychologists that we have never spoken to say we are mentally ill on Hannity and Colmes. We have read fabulous and wild stories about how our mom has raised us and how we perform in front of flaming swastikas and that we study books that say that Whites rule the world!!!! Sometimes the things the media says are so crazy we just bust up laughing. We figure that if what we believe and what we do was really so bad they wouldn't have to exaggerate so much to try to vilify us . Our mom thinks that it is proof that we are on the right track. It is said that no publicity is bad publicity, and it's true. Those who stand against your message have only furthered your cause. Your thoughts on this and has interest in Prussian Blue picked up because of this? Yes actually every time some stupid paper runs a story on us or uses that silly Hitler T-shirt picture we get money because our mom owns the copyright on the picture and we have an agent in New York who sends the publication a bill. So far the controlled media has made us a lot of money by sensationalizing everything we do. Tell us about the name Prussian Blue, why it was chosen and what is its meaning? Well we were on the way to a performance and mom said we needed a name. 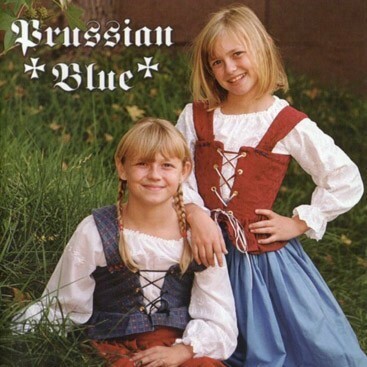 We were reading a Resistance magazine and saw the words Prussian Blue. Mom said that people would make a big deal that it was also the name of the Zyklon B residue but we didn't think it was that big a deal. We liked the idea because it is a pretty color and it is also part of our ancestry (Prussian) and we have blue eyes…. Your first release came out on Resistance Records. I understand William Pierce of the National Alliance heard the band play and signed you on and encouraged you to put out a CD, which you did called 'Fragment of the Future.' Your thoughts on this... how did you view Pierce then and give us your thoughts of him after his death. What do you think his death meant to the future? We thought of Dr. Pierce kind of like a kid would a famous person or a president or something. But also like a kindly grandfather type. We cried when we heard he died because it made a lot of people we know very sad, we were about 10 when he died. [April] In some ways Dr. Pierces death made a lot of people step up to the plate and for a while I thought that we would emerge stronger than ever. One could argue that the WN community is stronger now than ever. But it was fatal to the Alliance because it allowed a few bad seeds to get in a controlling position and they let it go to their heads. April, you broke from the National Alliance because of its new leader, E. Gliebe, and the direction he took it after Pierce's death. It would seem a lot of people split from the National Alliance because of Gliebe, and formed a new organization, National Vanguard. Can you enlighten us on this whole situation? [April] Well it is a really long story but I will try to keep it brief: After Dr. Pierce died he left no successor. He named Erich Gliebe the head of the Cosmotheist Church but not the National Alliance. He left a board to decide that. When pressed on this deathbed he would not name a successor. No one on the board wanted to be the chairman so Erich got the job. I was very supportive of Erich in this position. After a year the board dissolved as the board members asked for him to leave and charged him with misuse of funds. I supported him still during this time because I didn't have any reason to think otherwise. Then in 2004 I became aware of some of the things that Erich and Shaun Walker were doing that didn't seem correct. Trips overseas at the NA expense, immoral activities, refusal to disclose the financial information of the NA and the biggest thing was that I personally caught Erich in several lies about other people. He would lie so much that he forgot what he told whom and so he would contradict himself from one conversation to the next. This was when I started to question his behavior. Also at this time he got engaged to the "High Priestess of the Church of Hitler" a retired stripper who went by the name of Holiday. Erika and I had a disagreement when I requested that she get rid of the Church of Hitler website if she was going to be involved with the Alliance since it was stupid and hobbyist. Things went downhill from there and I decided that the best thing to do was to ask for Erich to step down at a public event. I had planned to stand up and do this at the 2005 leadership conference but they found out ahead of time and canceled the event. I joined with a group of former members and created National Vanguard. www.nationalvanguard.org is the website that we use to promote our organization. I write for them on occasion... . I understand that there has been problems over your first release with Resistance Records. Them not paying you the promised amount for CD's sold, etc., so you repressed it yourself and now Gliebe has threatened legal action against you. Please shed some light on this for us. [April] Gliebe has taken no legal action to date since he has no contract and it is actually "Ratsistance" records that has violated the agreement, not Prussian Blue. Shaun Walker has threatened that he would "throw me in jail" if I didn't pay him $7000 for the CDs that the girls have sold but I told him to leave us alone and we haven't heard back from him. It could be though that was because he got arrested for a hate crime soon after for a fight in a bar. The whole situation of E. Gliebe being the new operator of the National Alliance is fairly confusing, filled with bitterness and controversy. How was he able to take the reins, per se, and do you think Pierce could have imagined the negative state the National Alliance is in today? [April] If Dr. Pierce was alive for a day he would go to Hillsboro and blow Gliebe's brains out in my opinion. Lynx and Lamb, you are fraternal twins, born six minutes apart. How do you feel this bond shapes your music? Do you feel you can work better together because of this characteristic? They say that siblings have a unique ability to compliment each other in music especially with their voices, like the Carpenters or say the Osmonds…..that must be true and it certainly had helped us to spend so much time together. Sometimes we get on each other's nerves but that is understandable I guess. Some of your live performances have been marred with controversy. The mainstream 'powers that be' have canceled shows and attempted to give you a bad image, calling you racists and the usual propaganda. Tell us a little about these experiences and when can we expect to be able to see Prussian Blue perform live in the future? [Lamb] We played at the Kern County Fair in the fall of 2004. We did such a good job they asked us back the next year. We wanted some of our friends to come so we handed out fliers at the school. A girl who didn't like us got upset about it and made a fuss to the newspaper. The fair had to ask us not to perform since they were afraid that the anti-racists would show up and cause violence. Our mom agreed but noted that the same night a Mexican Nationalist band involved with La Raza was paid to perform at the fair. Most of the people that object to our music have never heard it, they just listen to sensational stories the media makes up, really our music is really pretty tame. You've also experienced problems offstage, such as in school. Are you still being home schooled? Why did you have to leave your school to be home schooled? How did your classmates treat you after learning of your band? [April] Lynx and Lamb never really "left" public school . They were home schooled due to the low quality of the schools in our area. Now they attend public school because we moved to a nice area in Montana and the schools are high quality. In Bakersfield they were assaulted by black boys but it had nothing to do with their politics, it was just Natural Law in our opinion. No doubt and THAT is what we are working to point out to everyone. Every time the media makes remarks about us to try to make us look bad it just sends more people our way because you know, we are right. You say that your music is intended for white people, does that mean that other races couldn't enjoy it? How would you feel if they did? You were eleven years old, as I understand it, when you begun Prussian Blue. You are now fourteen. I'm sure a lot has changed in those three years. The differences between your debut effort and your newest release reflect this. What are some of the biggest changes in this time for you, looking back? What sort of things do the two of you like to do in your spare time? Any hobbies? Right now we are going out for our High School swim team. We swam on a team in Bakersfield but we got very sick last year with whooping cough and couldn't swim so we are looking forward to this season. In Montana the swim season is in the wintertime since you have to swim inside anyway. The biggest change in our music is that we are writing most if not all of it ourselves and that we are covering a lot of topics besides White Nationalism in the lyrics. Now that the media knows who we are and what we believe, we don't feel we have to make an issue out of our political views all the time. The media will automatically connect our name to the issues and the questions that we want people to consider. Tell us about your new release, 'The Path we Chose.' It seems to be of much better technical quality than the first. Did you have someone different help you out with this one? The Path We Chose is actually more our own work because we wrote and composed 7 out of 9 tracks. We had studio musicians in Bakersfield help us with the recording playing drums, bass guitar and lead guitar on most of the tracks. Also this recording was done in a much better studio than last time. Our mom said that she wanted to allow us to do what we wanted musically and make something that we could really be proud of with the new CD and that was her reason for financing it. What influences your song writing? What inspires you in the face of adversity? [Lamb] Songs just seem to come to us. Sometimes I might be somewhere without my guitar and think of a song and I will know how my fingers will go on the guitar before I even play it. Recently the issues with our parents and other things in our lives have given us the ideas for our songs. For example the single "Your Daddy" which is about how our step dad is such a great father to our little sister Dresden and how we wish that we had a dad like that growing up. I understand you have received some threats because of what you do. Who are the real hate mongers... Since Prussian Blue has a lot of obvious uniqueness to it, it's easy to see why it has attracted so much attention, good and bad. How has the music scene and the movement in general accepted it? They recently arrested a boy here in Kalispell who sent us threatening emails. Some are really scary and some are just dumb. We wish the police or the FBI would take them more seriously. The White Nationalist community has really supported us across all organizations and websites. It is really nice to have that much support and kindness sent our way. The mainstream seems to be obsessed with our story. BUT, we got 4 out of 5 stars on a recent Earcandy review. What can we expect in the future of Prussian Blue? I imagine your thoughts are on a third release? You've also released a DVD, can you tell us about it as well? The DVD contains old home movie footage of us when we were babies, three music videos shot by Murrey Media and live concert footage from the 2005 Euro conference, Folk the System, Gathering of the Gods . We have about 5 new songs, counting the two singles we have recorded this year already. Hopefully we will have time to do something again but we have put out two CDs in two years so we feel we can take a rest for the moment. What would you say are the some of the greatest evils in today's world? And opposite, what good things has the world going for it? War and the way that the media lies are the greatest evils. The fact that there are still nice places like our town where people are mostly good, polite and kind give us hope. And at last, a question we pose to all we interview. The future of the world grows to be increasingly dark. With the fires of war and man's greed running full throttle. Do you see things getting better or worse in the near future? Wise men like Ed Steele say it is going to be worse soon. We hope to be able to grow up before it really gets bad, we would like to get to be normal kids in high school and have normal lives but that might not be possible. Lastly, April, Lynx and Lamb, we thank you for your time and thoughts! Your final thoughts and words of wisdom to the world? [April] It is a parent's responsibility to raise their child the best they can and that means to teach them the truth as you know and understand it. To do any less is bad parenting and a cop out.